What In The World Is A 'Closet Auger'? Everyone has dealt with a clogged toilet and a plunger is what most people think of when this problem arises. However a plunger is not very effective and will blow out the wax ring on your toilet if you are not careful using it. The answer is a Closet Auger, it’s a snake designed for a toilet. Closet augers have a long J shaped tube; the J end has a rubber coating. Inside the tube is a coiled wire snake attached to a handle on the opposite end. The closet name comes from the term used for a toilet enclosure which is called in the trade a "water closet"
To use the auger, draw the coiled wire into the tube, insert the rubber tipped J end into the toilet bowl drain opening. (The rubber tip protects the toilet bowl from damage). Push the coiled wire into the drain opening and turn the handle. Often just the action of inserting the coiled wire opens the drain, as the clog is pushed down the drain. If the clog is severe, turn the handle to break it up. 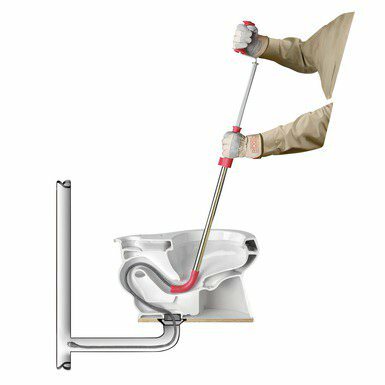 When the drain opens flush the toilet to clear the opening and clean the wire coil, retract the wire coil into the tube and remove the auger from the toilet. 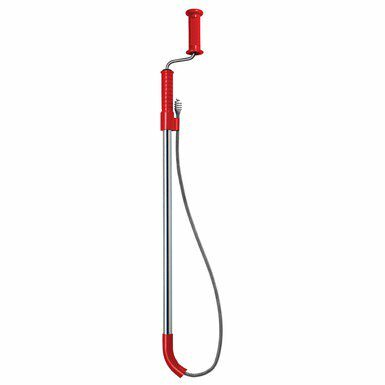 Take the auger outside and hose it off before storing it away. The next time your family clogs the toilet with too much paper, grab your Closet Auger and get it flowing again.